The Donati family and our Quilietti family are connected via the Brucciani sisters. The Donati family also came from Barga and Bagni De Lucca in Italy. The Donati family were documented as already living in Edinburgh in the 1881 Scottish Census. Gostini Donati was resident in Edinburgh’s Old Town at a flat at No. 9 Niddry Street, which is just off the Royal Mile in Edinburgh. With him was his wife ERMERLINDA DONATI, his cousins Raffaello Conti, Goseph Conti and Peter Pierotti. Gostini was the anchoring point for the exodus of the branches of our family who came to Scotland. These cousins are all described as figure makers and all born in Italy. The Conti connections we know because Eletta Brucciani’s mother was a Conti. Pierotti however is a new connection. He was most probably also connected via the Brucciani/Conti connections. In the villiage circa 1820-30 there were at least three Donati brothers, Antonio, Benedetto and Giovanni. The family were masters in the craft of marble and stucco and their trade was their lifelines in their new countries. 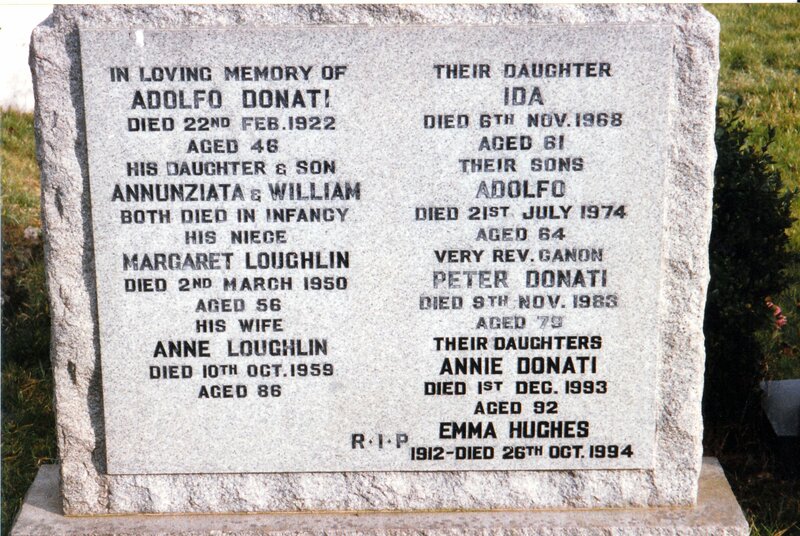 PIETRO DONATI was the brother who married Maria Domenica Brucciani, the sister of our Great Great Grandmother Eletta, and they came to Edinburgh, Scotland. One of their grand- sons became a priest and was Canonised in Edinburgh. Then we have Cesare Donati who also came to Scotland. He married Margaret Horsburgh, a Scottish girl. They had four sons who worked in Dundee and Edinburgh. Louis Donati married into the Ceccini clan. He died age 47 at South College Street, Edinburgh. There was also a sister Carubina Donati. She married her first-cousin Giovanni Donati. He was born on 24th June 1825 in Bagni De Lucca. They married in Italy and they left for Richmond ,Virginia, America and was working there as a confectioner in the year 1877. He had a short life however and died on 24th June 1882 age 57 years. Carubina died in 1888. They had two sons Andrew Adolph Donati and Vittorio Carlo Donati who were born in America. Their descendents are still there today. The family lived in the region around Barga in beautiful Tuscany. Our own relationship with the brothers Donati is through Antonio who married Annunciata Ricci in Italy circa 1830. We know about four of their children although there must have been more. There was a great exodus from Italy and especially from the region of Carrara around about the year 1885-1888 and many skilled craftsmen masters in the skills of marble left home to escape the hardships of the unification of Italy.. Many took up their arts as figurine makers. Pietro Donati was one of these men. He left with his wife and family and they found there way to Scotland’s Capital, Edinburgh. In 1901 we find the family having moved from the historic Royal Mile in Edinburgh, which buildings were really slum tenements at the time to an address further up the hill at 10 West Preston Street, Newington, Edinburgh. They lived here for a while later moving to 5 Keir Street, Edinburgh. ANNUNZIATA DONATIwas born on 2nd February 1886 in Italy. Her father’s profession in Scotland was lucrative and he earned enough that she might have a good education. She became a schoolteacher. In the year 1911 she married to another Italian immigrant by the name of Colombo Arcari. Colombo, like a lot of the new immigrants including my own great grandfather took up the profession of confectioners and ice cream manufacturers. The Scots have traditionally been lovers of anything sweet and the canni Italians were soon to catch on and learn that this was a real moneymaking profession in their new homeland. They married at St. Columbas R.C. Church, Upper Gray Street, Edinburgh, on 29th August 1911. This branch of the Arcari family had settled in Glasgow and his address was given as 487 Sauchiehall Street, Glasgow. There were however brothers of the Arcari family who settled in Edinburgh. His father was Archili Arcari, Confectioner and Maria Assunta Faccenda..
EMMA DONATI was born in 1885 in Italy. In the year 1910 she married LUIGI SANTE POMETTI. Luigi was also a confectioner by trade and his family had settled just outside Edinburgh in a village called Newtongrange. His address was gaiven as 5 Loan Road, Newtongrange. Like her sisters before her she was married in St. Columbus R.C. Church in Newington, Edinburgh. IDA DONATI was born on 18th July 1907 at 40 St. Mary’s Street, Edinburgh. She died on 5th November 1968. She never married. EMMA DONATI was born on 3rd March 1912 at 32 St. Mary’s Street, Edinburgh. She died on 26th October 1994 age 82. Emma married Peter Hughes on July 15th 1940. We have found three children to date. PAULINE MARY HUGHES was born on 8th December 1942. VALERIE ANNE HUGHES was born on 13th April 1941 and PETER ALEXANDER HUGHES was born on 18th September 1947. Valerie became a nurse and moved down to Dumfries where she met and married William Martin on 9th November 1963. They have one daughter Fiona Clare Martin who was born in 1964. ANNUNZIATA DONATI was born on 8th February 1914 at 5 Keir Street, Edinburgh Annunziata married James John Albert Hickeyin 1937 and it was her brother Peter who married the couple. They married in the Church of the Sacred Heart in Lauriston, Edinburgh. James was an upholsterer by trade. They lived at 38 Pencaitland Terrace, Penicuik, which is a village just outside Edinburgh. She died on 1st September 1978 at the CityHospital, Edinburgh. They have at least one son called P. Hickey who was mentioned on the death certificate of his mother in 1978. 6. PETER DONATI was born in 1904. He became THE VERY REVEREND CANON PETER DONATI . We therefore assume that he had no issue!! He died on 5th November 1968 age 79. To be Canonised must have been a great joy for his family. 8. ANNUNZIATA who also died in infancy it is common for later children to take the names of elder siblings who have previously died. The family have a lair in EdinburghMount VernonR.C.Cemetery Section K 832/834. Maria Brucciani lies here with her children. We do not know where Peter was buried. He is not on the headstone in the cemetery..
ANTONIO DONATI who married ANNUNCIATA RICCI – our branch as described above. Four of their children came to Scotland. CESARE ALEXANDRE DONATI born 11th July 1892 at 2 Drummond Street, Edinburgh. His occupation was given as Hotel Boots on both his marriage and death certificates. He worked at the time of his marriage at the Marine Hotel, North Berwick. He married Marion Ferguson and we have traced one daughter called Hilda Cox who in the year 1972 was living at 7/6 Oxgangs Drive, Edinburgh. Her proper name is Margaret Matilda Donati and she was born on 22nd January 1923 at 119 Easter Road, Edinburgh. Cesare served in the army and died in the War Memorial Hospital in Peebles, Scotland on 25th February 1972. JOHN WILLIAM CURRIE DONATI was born in 1896 and died the following year due to convulsions whilst teething. family have a lair in EdinburghMount VernonR.C.Cemetery Section K 832/834. Giovanni and Carubina Donati are my paternal great, great grandparents. Vittorio Carlo Donati was my great grandfather. James Andrew Donati was my grandfather and Victor C, Donati was my father. I have much information about this family should anyone be interested. My grandfather was born in Barga, Italy in 1892 and came to America in 1910. He was sponsored by the Pieroni family and eventually ended up in Muncie, IN. There is still a Carlos living in Barga and Scotland. Thank you Dale for getting in touch. Your grandfather would have been related to our branch of the Donati family in some way or another, I am sure. d What was your grandfather’s forename. My grandfather was william currie who worked at the Marine Hotel in north berwick. Was there a conection in the naming of baby John? My grandfather was married to sarah who also worked at Marine hotel. William Currie died about 1936 in North Berwick. Thanks for this page, it has helped find some ancestors. 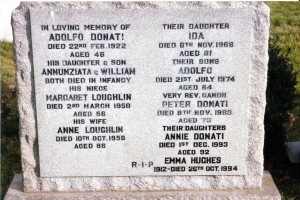 My Dad’s great grandad was Pietro Donati, his grandad was Adolfo Donati, his mother was Mary Donati. She married Francis Connor and had four children; Francis, Peter Adalpho (my Dad), Anthony, Edward. Hello Jenny I am just thrilled to pieces that you have found us through these webpages. Our families are linked way back to Italy in the 1850s where the Brucciani family lived at the time. I have sent you a wee e.mail and hope that you will get back in touch. I have worked it out through our ancestry tree. You and I are 4th cousins. I am first born American from Scottish and English parents and was involved with a ‘Donati’ descendant originally from Italy and later from Argentina. Intersting information you have provided here and certainly something to chuckle about considering I thought how differenet we were! Thanks and best wishes to all. Jenny – please email me at joconnor@juno.com We are cousins. My father was Albert Edward (Ted) – your father’s brother. Sadly, he died in 1988 at age 57. My grandmother was Mary Donati and after her marriage to Francis Connor dissolved, she married Harold Ross. They did not have any children. I never met your father or brothers, but my father told me he met Peter and Tony. He also had a sister named Maureen and she became a nun, but later left the order to marry. I’d love to hear more from you and from any other relatives here. I have no information about Francis Connor’s side of the family or much about him really and would love to know more. I’d like to add that I remember being introduced to some cousins in Dalkeith when I was a child. They were the Luchessi family and I was told that their ancestors had come to Scotland with the Donati family. I have not seen them for decades as I moved overseas.Does anyone know of them? I believe we are related. My grandfather was Francis Connor, son of Mary Donati. If you get this message please get in touch!